460 pages | 61 B/W Illus. This fully updated third edition of the highly praised Cognition and Emotion provides a comprehensive overview of contemporary research on both normal emotional experience and the emotional disorders. 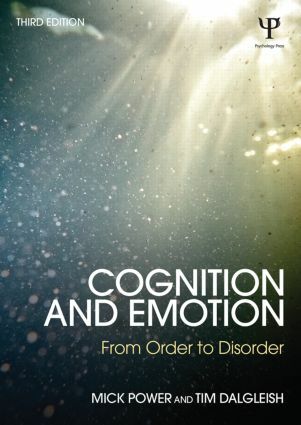 The book provides a comprehensive review of the basic literature on cognition and emotion – it describes the historical background and philosophy of emotion, reviews the main theories of normal emotions and emotional disorders, and the research on the five basic emotions of fear, anger, sadness, anger, disgust and happiness. The authors provide a unique integration of two areas which are often treated separately: the main theories of normal emotions rarely address the issue of disordered emotions, and theories of emotional disorders (e.g. depression, post-traumatic stress disorder, and phobias) rarely discuss normal emotions. The book draws these separate strands together, introducing a theoretical framework that can be applied to both normal and disordered emotions. Cognition and Emotion provides both an advanced textbook for undergraduate and postgraduate courses in addition to a novel approach with a range of implications for clinical practice for work with the emotional disorders. Mick Power is a Professor of Clinical Psychology at the National University of Singapore. In the past he has worked at universities and hospitals in London, Edinburgh, Norway, Italy, China and New Zealand. He has worked for the Medical Research Council and for many years has been a Research Advisor with the World Health Organization. Tim Dalgleish is a Senior Research Scientist and practising clinical psychologist at the Medical Research Council Cognition and Brain Sciences Unit in Cambridge. His main research interests include psychological reactions to trauma and cognition-emotion relations in the emotional disorders.